Brad Tritle is known as a leader, collaborator, and innovator. Tritle's career has been a unique blend of strategic leadership in both the private and public sector, focusing on high technology and health information technology (HIT) projects that have been poised to impact the population at large. Mr. Tritle currently serves as Director of Business Development for Vitaphone USA, focused on chronic disease management through mobile/remote patient monitoring and engagement. He also is co-founder and advisor to eHealth Nexus, which offers a medical record retrieval/abstraction service for consumers. As a consultant, he has focused on Health Information Exchange (HIE), Personal Health Records, consumer engagement, healthcare market analysis and business development. His consulting clients include the federal government, state HIEs, telecommunications and software firms, and non-profit organizations. Mr. Tritle is also on the advisory boards of both 360Vantage and Tiatros. In July 2010, Mr. Tritle was chosen by national leaders in Health Information Technology (HIT) to lead a pilot implementation of a health record bank as President and CEO of eHealthTrust Arizona. eHealthTrust provided consumers with individually controlled accounts in which to store their comprehensive health records, and tested numerous engagement strategies, including television, radio and billboard, as well as social media advertising. Prior to eHealthTrust, in September 2007, Mr. Tritle was chosen by the Arizona Health-e Connection (AzHeC) Board - including the Governor's Office, State Medicaid Director, and executives from physician associations, hospitals, industry and health plans - to become AzHeC's first full-time Executive Director. AzHeC is a statewide non-profit that supports HIE, is Arizona's Regional Extension Center, and leads efforts surrounding e-prescribing and consumer engagement. Mr. Tritle is a contributing editor/co-author of the recently-release HIMSS book entitled Engage! Transforming Healthcare Through Digital Patient Engagement, and has written or contributed to other books and white papers. Certified Information Privacy Professional (CIPP). 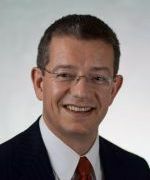 He currently chairs both the HIMSS Social Media Task Force and the Health Record Banking Alliance Business Model Committee, and is on HIMSS eConnecting with Consumers Committee. He holds a B.A. with Honors in Asian Languages from Arizona State University. He has a passion for family, faith, wellness, nutrition and fitness, and is an avid reader and musician.